In South Korea, there is a famous saying that if a stone is thrown from Namsan, located at the heart of Seoul, it is bound to hit a person surnamed Kim, Lee or Park. However, the latest Population and Housing Census, conducted every 15 years, has revealed a diversifying trend in Korean names. Some 4,800 new family names were created within the past 15 years. There were a total of 5,582 different family names as of 2015, and about 73 percent of them do not have matching Chinese characters, departing from a long tradition here. Those names were registered by foreigners who obtained citizenship here. It is a sign that the Korean society is increasingly diversifying with the growth of its multicultural population, Statistics Korea and experts said. 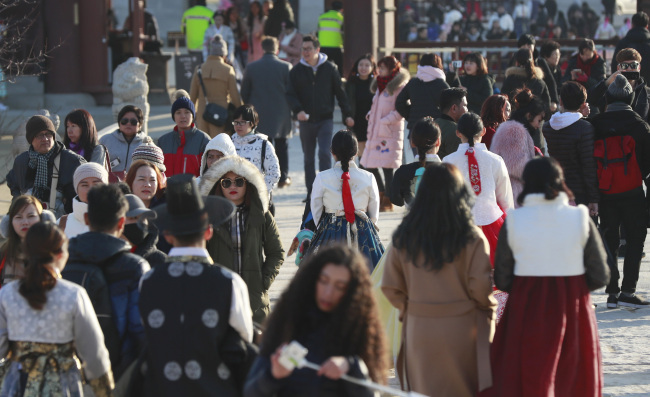 “Traditionally, one’s family name was a critical factor in recognizing the makeup of one’s ancestry and clan,” said historian Park Hong-gab, adding that the recent trend depicts the changing face of the local population. “With the rise of international marriages and many foreign residents becoming naturalized Koreans here, our society is witnessing the emergence of new foreign-origin family names,” he explained. Still, the census showed 1 in 5 Koreans are surnamed Kim, nearly 1 in 7 have the surname Lee and 1 in 12 have Park as a family name. Together, the three surnames account for 44.6 percent of the country’s 50 million population. Also among the top 10 most common surnames in Korea were Choi, Jung, Kang, Cho, Yoon, Chang and Lim. Together, they account for about 64 percent of the total. Unlike traditional Korean family names, which typically consist of only one syllable that can be written in Chinese to identify the clan’s city of origin, most newly created surnames do not follow such rules. While some naturalized Koreans choose to follow their spouse’s Korean surname, others sometimes create new family names by picking one syllable from their original surname, for example “Le” from “Lei,” according to an official at the Seoul Metropolitan Government who said she had worked with naturalized Koreans in Seoul. According to separate data from the Supreme Court, since 2011, an average of 6,000-7,000 foreigners who were naturalized as Korean citizens registered Korean names with the court. Officials said not all who obtain Korean citizenship choose to register Korean names, but many still do so to mingle better with locals. “Foreigners tend to get Korean names by writing down their original names as the way it sounds so it can be easily pronounced, as part of their efforts to make themselves a member of Korean society,” said Park Jung-mi from the Cheongju Multicultural Family Support Center. “Some even simply translate their original name into Korean,” she added, giving an example of a woman from the Philippines who named herself Jang-mi, a direct translation of her Filipino name Rose. She put her surname as Nam, meaning that she had come from the West to Korea.